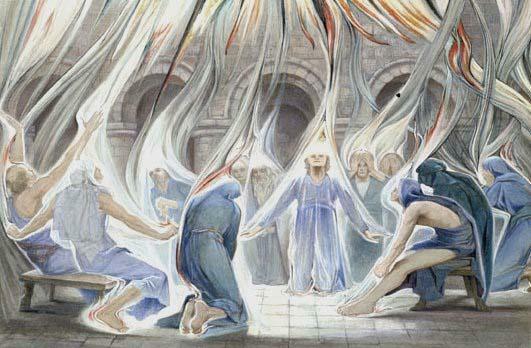 After Easter, Pentecost is my favorite Christian feast day. Often called the “birthday of the church,” the experience of Pentecost has a lot to say about the way we live as Christians and the way we relate, as church, to the world. In John’s version of the Pentecost experience (Jn 20:19-23) [more famous for doubting Thomas], we read that the disciples, filled with fear and despair, locked themselves away in a room. Can we really blame them for this reaction after they witnessed their Lord and friend suffer a terrible public death at the hands of their government and the ruthless empire? Thankfully, the actions of God in history did not end with the Resurrection and Ascension. God, as we know, did not want the followers of Christ to cut themselves off from the world in fear and despair or to retreat (like some sects were doing) into caves. In the midst of their fear, God empowered the first Christians with the gifts of the Holy Spirit to go out into the world in mission. As we read with St. Paul, the reception of the Holy Spirit by a Christian is not a prideful individualistic event. When we receive the Spirit, we are called to go out to others. Gifts of the Spirit, he insists, are given for the common good (1 Cor 12). (There is no I in Pentecost as my friend Kathryn writes). From a position of fear, the apostles left the safety of the room to go out into world. Immediately, Acts tells us, they encountered and communicated with people from Asia, Africa, and Europe (Acts 2:1-11). The reception of the Spirit enabled them to understand what freedom really means. Freed from their fears of “the world,” they journeyed deeper into it to preach the Gospel and undertake actions of love and justice. The church today, like the community locked in the room or the church in the 19th century, is in need for a new Pentecost. Too often Christians (both on the so-called “right” and “left.”) seem to be beset by despair and its related vice of pride. Perhaps unduly influenced by the culture wars and polarized political context of the United States, many Christians define ourselves more by what we are against (e.g., anti-abortion, anti-contraception), rather than what we offer the world. Contrary to the Catholic tradition of defining in freedom positively (freedom for) religious freedom in this context is often defined negatively (freedom from). Pride (“we have all the answers”) and despair (“the world is against us”) may work well in mobilizing forces in the culture wars, but they do not, as the teachers used to say, “leave room for the Holy Spirit” and they do not reflect the true notions of Christian freedom. Are we open (humble as Kevin Johnson writes) to receive the Holy Spirit in our lives? Are we operating as persons and as church from fear or from hope? What do we offer the world with our freedom (freedom for)? What gifts have we been given for the benefit of others (Paul)? In the next post, Amanda will deepen these reflections by reflecting on the communal dimension of following the impulse of God’s Spirit of hope.